Tornadoes can be absolutely devastating here on Earth, costing billions of dollars yearly in property damage. But even the most severe of Earthly tornadoes has nothing on this behemoth: Scientists have recently discovered a massive supertornado on the surface of the Sun five times bigger than our own planet. The swirling gas was discovered by NASA's Solar Dynamic Observatory satellite in September 2011. News of the tornado's existence was presented to the National Astronomy Meeting 2012 today in England. Clocking in at 186,000 miles per hour, the speeds of this tornado absolutely dwarf those of a storm on Earth. Terrestrial storms don't exactly get as hot as this tornado either: The solar storm's temperature ranges between 90,000 and 3.6 million degrees Fahrenheit. 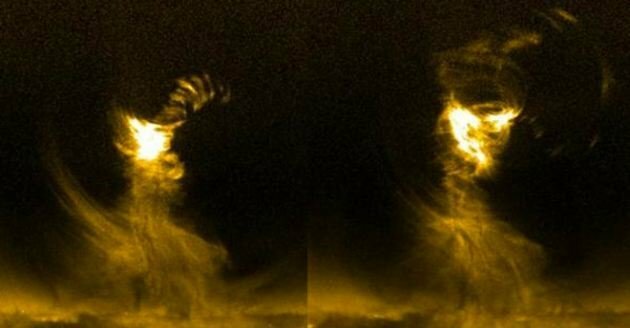 While scientists have viewed large solar tornadoes in the past, this one is easily the biggest ever observed. The cause of the storm is believed to be the twisting of the Sun's magnetic field. A video of a similar storm is available below. I wish I had thought of that. Well done.